The ATOM Project is urging the international community to observe a moment of silence on the occasion of UN International Day against Nuclear Tests on August 29 in memory of all nuclear weapons-testing victims. The ATOM Project and its Honorary Ambassador, Karipbek Kuyukov, wants people around the world to observe 11.05 a.m. their local time as a moment of silence. The exact 11:05 a.m.time was chosen because, at that time, analogue clock hands form a “V,” symbolizing victory. The moment of silence and the representation of victory honour those who have suffered and urges the international community to continue to seek victory over the nuclear weapons threat. “The effort continues to bring the Comprehensive Nuclear Test Ban Treaty into force and to permanently end the weapons testing. Still today, there are many living victims of nuclear weapons testing struggling with the emotional and physical scars of decades of nuclear weapons tests,” said Kuyukov. Kuyukov, himself, was born without arms as a result of his parents’ exposure to nuclear weapons testing. He has overcome that challenge to become a renowned artist and globally recognized non-proliferation activist. He has devoted his art to capturing the images of nuclear weapons testing victims and his life to the elimination of the nuclear threat. 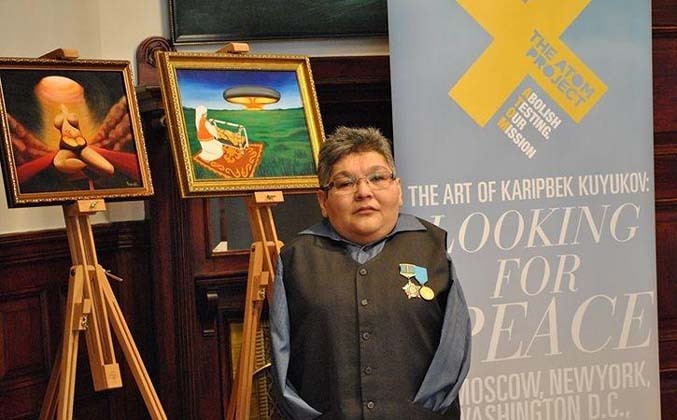 He is one of more than 1.5 million Kazakhs negatively impacted by exposure to nuclear-weapons testing. On Dec. 2, 2009, the 64th session the United Nations General assembly established by unanimous vote the United Nations International Day against Nuclear Tests. The vote was initiated by Kazakhstan to commemorate the date in 1991 – August 29 – when Kazakh President Nursultan Nazarbayev made the historic decision to close the infamous Semipalatinsk nuclear test site in East Kazakhstan, where 456 nuclear tests were conducted. August 29 in 1949 was the date of the first Soviet nuclear weapon test there. The ATOM Project seeks to unify support for the entry into force of the Comprehensive Nuclear Test Ban Treaty (CTBT). The treaty was open for signature in 1996 and has been signed by 183 nations. It has been ratified by 166 countries, however, it has not entered into force because it has not been signed or ratified by eight specific states listed in CTBT Annex II – China, Egypt, India, Israel, North Korea, Pakistan and the United States. TAIPEI — Taiwan’s largest opposition party Kuomintang has announced that it has collected some 470,000 signatures supporting a referendum on whether to lift a ban on the import of food products from five Japanese prefectures, including Fukushima, imposed after the 2011 Fukushima No. 1 nuclear plant disaster. The number is far more than the 280,000 legally required to hold a referendum, and it is most likely that one will be held on Nov. 24 in tandem with general local elections. Taiwan has banned foodstuff from the prefectures of Fukushima, Ibaraki, Tochigi, Chiba and Gunma in the northern and eastern parts of Japan, and the Kuomintang supports the ban. A national referendum must have a turnout rate of at least 25 percent for the result to be valid, but this hurdle is likely to be cleared if the voting is done alongside the local elections. If voters back the ban, it would be extremely difficult for the administration of Tsai Ing-wen to ignore the outcome and Japan-Taiwan relations would suffer substantially as a result. Behind the referendum move is a political rivalry between the Kuomintang and the ruling Democratic Progressive Party (DPP) headed by Tsai. The opposition is stepping up attacks on the ruling party in a bid to win the local elections and build political momentum toward the 2020 presidential election. The government of Japan has repeatedly urged Taiwan to lift the import ban, saying the safety of its food items is scientifically proven. However, the Tsai administration is hesitant about rushing a decision on resuming imports as it faces faltering approval rates and the issue could trigger explosive opposition from some voters. Toru Hasuike, a former employee of Tokyo Electric Power Co., talks about his new book in Kashiwazaki, Niigata Prefecture. KASHIWAZAKI, Niigata Prefecture–Toru Hasuike, who worked at Tokyo Electric Power Co. for 32 years, has published another book that he says shows his former employer should be declared “ineligible” to operate nuclear power plants. Like the one they did in 2011??? People are helped into a Maritime Self-Defense Force helicopter as part a two-day evacuation drill for multiple nuclear accidents in Oi, Fukui Prefecture, on Saturday. FUKUI – A nuclear disaster drill for simultaneous accidents at the Oi and Takahama nuclear power plants in Fukui Prefecture ended Sunday after mobilizing 21,000 people. It was the first disaster response drill designed for serious simultaneous accidents at multiple plants since the Fukushima nuclear crisis in March 2011. The drill involved about 21,000 people including residents and officials from the Cabinet Office, the Nuclear Regulation Authority and municipal governments. Sunday’s exercise focused on evacuating residents from Fukui and surrounding prefectures. It also involved personnel aboard the Maritime Self-Defense Force minesweeper tender Bungo, which was deployed to provide first aid to “injured” participants who were ferried there by helicopter. In the town of Takahama, 20 residents were flown to Osaka on a Ground Self-Defense Force CH-47J chopper and bused to Sanda in Hyogo on the assumption that a evacuation route was cut off by a landslide. Preparations involving the Oi and Takahama plants, both managed by Kansai Electric Power Co., are deemed necessary as they are just 13.5 km away from each other. The exercise assumed radioactive substances were released after an earthquake in northern Kyoto knocked out the cooling systems of the two plants’ reactors. As part of the drill, task forces created at the two plants’ off-site emergency response centers were integrated into Oi’s task force. Katsunori Yamamoto, 64, who runs a nursing home 5 km from the Takahama plant, played one of his residents. He was evacuated to Tsuruga by a wheelchair-accessible van driven by a Kansai Electric worker. “I want to assess risks to our nursing home residents,” he said. The nuclear establishment cannot be trusted on radiation. Beware of the nuclear apologists. Renewable energy systems set to go ahead with new technology enhancing flexibility. AUSTRALIA. Australia’s climate change policy sets a dangerous precedent for the world. Australia’s new Cabinet: A motley crew of climate denialists and pro nuclear proponents. JAPAN. Japan’s 2020 Olympic Games a public relations cover-up of the Fukushima fiasco, for the nuclear industry. Risk of terrorist attacks in Japan Olympics: Japan strengthening waterfront security. Japan’s emergency drill envisages nuclear accidents at multiple locations. Watchdog says TEPCO nuclear disaster drill ‘unacceptable’. Big safety costs for Japan’s nuclear power stations- and costs will grow yearly. -Japan plans to reduce its 47.3 tons of stockpiled plutonium. Fukushima: UN says cleanup workers in danger of ‘exploitation’. FRANCE. Hot weather continues to cause lower nuclear power production in France. Increased danger for mountaineers, as climate change melts the French Alps. RUSSIA. Scepticism, even among pro-nukers, about Russia’s much boasted floating nuclear power plant. Russian official threatens use of nuclear weapons in Syria. UK. Following Brexit, UK will no longer be a member of Nuclear Fusion for Energy. UK government outlines plans for the civil nuclear sector if Britain leaves European Union without any deal. Continued safety worries at UK’s Atomic Weapons Establishment (AWE). Dumping of Hinkley nuclear’s radioactive mud would break the law. Blackwater Against New Nuclear Group (BANNG) points out the climate change threats to proposed Bradwell B new nuclear power station. Following Chernobyl, Britain’s District Councils’ information role was limited to PR for the government. Demolition of Windscale Pile One Stack at Sellafield. Donald Trump has directed the secretary of state, Mike Pompeo, to delay a planned trip to North Korea. USA emergency measures include preparations for nuclear attacks on 60 U.S. cities. The nuclear modernization program is not sustainable economically– Kristensen. Why bother with an underground bunker? USA tests Upgraded ‘Earth-Penetrating’ Nuclear Bomb. Nobody wants to pay the $4.7 Billion Nuclear Bill for South Carolina’s abandoned nuclear project. Nevada residents strongly opposing proposed Yucca Mountain dump scheme. Plutonium remains in the ground below proposed Rocky Flats national wildlife refuge. Small Modular Nuclear Reactors could be a costly mistake for Idaho utility. Hotter water forces Pilgrim nuclear power plant to half capacity. U.S. army increasing its investment and use of solar power. PAKISTAN. Imran Khan and Pakistan’s nuclear bomb. SOUTH KOREA. War fear panic is good for bunker salesmen in South Korea. TAIWAN. Taiwan Premier encourages renewable energy, repeats commitment to phase out nuclear power. IRAN. Britain is now contributing to upgrade of Iran’s Arak nuclear reactor. FINLAND. Finland company looks to China’s lucrative nuclear decommissionig and nuclear waste market.